Oh by the way, did we mention we have finished our bike ride? Yep, we rode the last bit from Bariloche, Argentina to Puerto Montt, Chile. After over two and half years and pedaling over 22,000 Kilometers (almost 14,000 miles) we have reached a place we consider a final ending point of our north-to-south journey. After spending a wonderful month in Bariloche, Argentina cycling unloaded, hiking, Randy working remotely and Nancy drawing and exhibiting her work, we headed out for out final trip bike trip but not our final adventure. We celebrated the end of this trip and the beginning of the new year in a tiny campground in southern Chile and rode to the end of our trip. On January 1st, 2009 we rode our loaded metal steeds to Puerto Montt, Chile and retired our bikes to a closet for a couple of weeks. 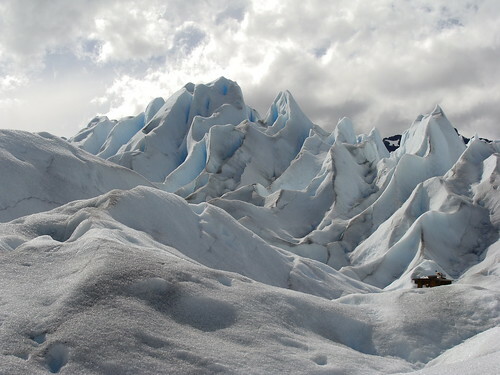 We were told by many people that if we came all this way in South America we could not miss the dynamic sights in southern Patagonia, Torres Del Paine National Park and the still-growing Perito Moreno Glacier. So as the good travelers we are, we took a vacation from our bike ride and headed the very bottom of South America, to Punta Arenas, the southernmost city on the continent of South America. But we went by plane this time. The logistics of travel arrangements were more complicated than riding our bikes there because it's the high season, with thousands and thousands of tourists, but with lots of planning ahead and patience and a bit of money, it's great. It is a backpacker's paradise but can be explored without lugging the world on your back. After travel by plane, buses, more buses, tours, and boat rides we reached the first of our travel goals, the Perito Moreno Glacier near El Calafate in Argentina. I don't have the words to describe the wild place full of turquoise lakes, unusual flora and fauna and glacier-clad mountains that rise straight up to the turbulent Patagonia skies. We got to visit the glacier and even hike on it with crampons. It was a very impressive sight. even though we saw glaciers in Alaska and Canada, the Perito Moreno glacier is tremendously impressive. You can see it flowing down from the huge Patagonian Icefield above, and it's one of the few glaciers in the world that is still advancing, not receding. As a result, it's all white, not the dirty color of many of the receding, melting glaciers. It was amazing. 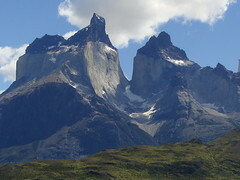 We then returned to Chile and did three days of day-hiking in the incredible Torres del Paine National Park. The lakes and mountains of this district are deservedly world-famous. We should have backpacked at least the 5-day "W" circuit, but instead we stayed in a lodge and did day hikes, and thoroughly enjoyed ourselves. The views are amazing. Click here for our favorite pictures from Torres del Paine. And now we're in Santiago, the capital of Chile, packing up our bikes for the plane ride tomorrow. We fly to Miami via Bogota. Then we're going to bike from Miami through the Everglades to Naples, Florida as a strange little postscript to the trip. There we'll spend a couple of months with Nancy's dad, Frank Lewis, and Randy will continue working and Nancy's going to do a lot more painting. She's getting an article ready to post with some of her favorite watercolors she's done on the trip. We'll still be posting catch-up articles for a few weeks, at least. There's so much to remember aobout the trip. We're considering going through all our pictures and posting our favorites for you.